In March of 1735 finally the first diplomatic letter from Siam since the handover of power in January 1733 reached Batavia. 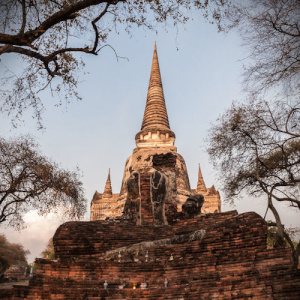 After King Thai Saa passed away on 13 January 1733, various court factions had clashed, each one from its own palace in Ayutthaya. Prince Phon (the brother of King Thai Saa), who occupied the Wang Chankasem (Front Palace), cleverly managed to exploit the chaos and took the royal palace. Various members of the royal family escaped, some in Buddhist robes, but were arrested in the following days and put in chains. The two princely opponents, the sons of King Thai Saa, were executed in the royal way, namely by having them clubbed to death with pieces of sandalwood. In this was Prince Phon assumed power as King Borommakot. The new Phrakhlang was the same khun Chamnan who had joined in making Prince Phon’s coup possible. He became the most important centre of power during the reign of King Borommakot. The Dutch representatives in Ayutthaya initially judged that this new Phrakhlang would be very well disposed to the VOC. If the Supreme Government had already been persuaded by this optimism, then this first letter will have put a damper on the joy. The Phrakhlang states in clear terms that the payment for the goods supplied by the Company would be made partly in sappan-wood, in conformity with the old custom, and not half in tin and half in silver. The reason given by the Phrakhlang is interesting: the khlang would reject it, and he is not in a position to make changes. It is clear that the royal merchants who were combined in this khlang were protecting their trading interests. If they should alter the delivery of sappan-wood and supply other products to the VOC, then that would be detrimental to the prices that were asked from Asiatic merchants for products, such as lead, ivory, gum resin and so on. The Phrakhlang was primarily concerned to maintain the customs observed in trade. In order to establish these anew, he set up an investigation into the old trading contracts. The copies of these that were found in the VOC lodge had been damaged by insects and were illegible. They were compared with the copy that was kept by the Siamese syahbandar, but this was in just as bad a condition. In the diplomatic correspondence there was often reference to these contracts, but the facts reveal here that the documents were in a neglected state, with both the Company heads and the Phrakhlang (who had them kept by the syahbandar). The reply from Batavia is disappointed and direct in tone. They wish the new king all the best, but at once let it be known that the VOC actually wants to do away with payment in sappan-wood. If that does not happen, then the VOC will dismantle its lodge in order to avoid any further losses. The value of ‘that dye-wood’ has fallen so much ‘that it cannot be counted as any better than firewood’. Batavia sends a new Opperhoofd (Senior Trader), Theodorus van den Heuvel, reports the appointment of Governor-General Abraham Patras, and is sending as gifts a number of cloths, of which Siam probably already had plenty. Bhawan Ruangsilp. Dutch East India Company Merchants at the Court of Ayutthaya: Dutch Perceptions of the Thai Kingdom, c. 1604-1765. Leiden/Boston: Brill, 2007, pp. 180-194. Hendrik E. Niemeijer, “Letter from the Chaophraya Phrakhlang on behalf of King Borommakot (1733-1758) to the Supreme Government in Batavia, (received) 22 March 1735, and the answer from Batavia, 12 August 1735”. In: Harta Karun. Hidden Treasures on Indonesian and Asian-European History from the VOC Archives in Jakarta, document 26. Jakarta: Arsip Nasional Republik Indonesia, 2016.